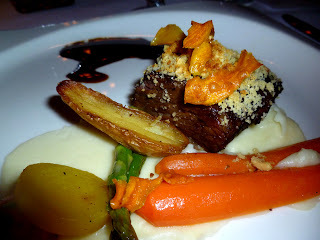 Last night we attended the Open Chef Night at the Westin Bear Mountain Hotel in the Panache Restaurant. The beautiful décor and some great food was truly “panache”. The food was excellent and we got to meet some nice people and some old friends. Open Chef Night allows aspiring student chefs to battle it out as Executive Chefs for a night in Panache, Bear Mountain's intimate fine dining restaurant. Each Chef brings a new culinary experience for you to enjoy all under the guidance of The Westin Bear Mountain's very own, Executive Chef Iain Rennie. The series takes place on the last Wednesday of every month and will run throughout the school year. Kudos to Chef Rennie for giving young aspiring junior chefs the opportunity to grow and develop. The dinner was critiqued by judges and then a winner was chosen. Tonight’s chefs were Edwardo Marquex and Sabrina Cozens. Sabrina was declared the winner, in a very close competition. The judges had a few suggestions, but overall everyone (guests and judges) were very impressed at the quality of the food. Two menu options were available to choose from. Menu A, was three courses. Lobster soup with Roasted Pork Belly, Black Olive Powder and Crispy Fingerling Potato, then a main of Braised Short Rib with Pomme Purée, Crispy Root Chips and Red Pepper Jus and finishing with Citrus Almond Cake, Lemon Blueberry Semifreddo and Lavender Crumble. Do I have your attention! Menu B was also three courses. Wild Mushroom Soup with Sage Powder and Scallops, then a main of Wild Rice Crusted Sous Vide Pork Tenderloin, Vanilla Yam Purée, and Roasted Fingerling Patatoes and finishing with Okanagan Peach Crumble, Vanilla Bean Ice Cream, Caramelized White Chocolate and Peach Fluid Gel. We each tried different meals so we could get a good feel for what was presented. It was all very good and well presented. Well done chefs! Enjoy a superb three course meal for $45 per person. Reservations are strongly recommended as the event routinely sells out. Call 250-391-7160 or email dine@bearmountain.ca. For more pictures please go to our Facebook site.